Here you will find complete information about websites and portals where you can find FREE GIS, Remote Sensing, spatial and hydrology data as a service, also tons of interesting articles, tutorials and reviews about GIS, Remote Sensing and Spatial Hydrology data and data warehouses where you can download spatial data FREE with a minimum effort. For an example where you can directly download FREE spatial data which are been catalogued by Global, Regional, Continent, Country and river basin wise. UNEDP's Environmental Data Explorer is the authoritative source for data sets used by UNEP and its partners in the Global Environment Outlook (GEO) report and other integrated environment assessments. 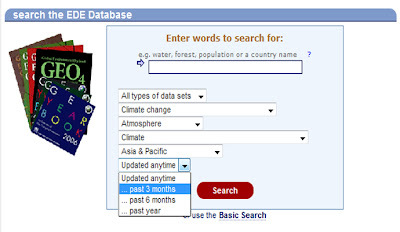 Its online database holds more than 500 different variables, as national, subregional, regional and global statistics or as geospatial data sets (maps), covering themes like Freshwater, Population, Forests, Emissions, Climate, Disasters, Health and GDP. Display them on-the-fly as maps, graphs, data tables or download the data in different formats. The navigation within the Environmental Data Explorer is fairly easy and straightforward. In most cases you will have to select something (eg. a dataset, years, a module etc. ), before being able to continue in the process. After having done your selection, you just have to click on the button to proceed in the process. If you like to return to revisit or change the options you use the button. If your selected values are what you need, but you want to treat the data further on your computer, then download the data in different version, ranging from simple text to Excel and GIS formats. Also, by clicking on the map image, you will enter onto an Internet Map Server (IMS), which produces on-the-fly a map covering your selected attributes (variable, region, time). 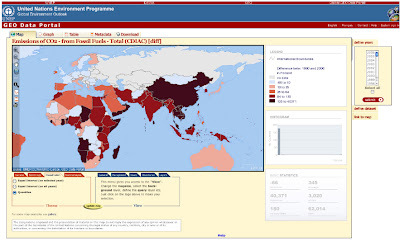 You can zoom into the map to get more details, identify a countries name and value, produce a graph etc. 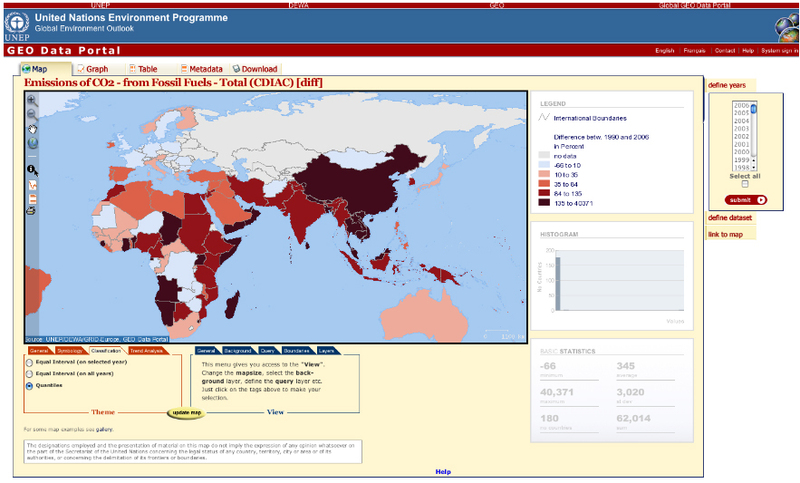 to visit UNEDP Environmental Data Explorer! FAIR USE NOTICE: This site contains copyrighted material the use of which has not always been specifically authorized by the copyright owner. We are making such material available in our efforts to advance understanding of environmental, political, human rights, economic, democracy, scientific, and social justice issues, sustainable development, environmental, community and worker health, democracy, public disclosure, corporate accountability, and social justice issues, etc. We have included the full text of the article rather than a simple link because we have found that links frequently go "bad" or change over time. We believe this constitutes a "fair use" of any such copyrighted material as provided for in section 107 of the US Copyright Law. In accordance with Title 17 U.S.C. Section 107, the material on this site is distributed without fee or payment of any kind to those who have expressed a prior interest in receiving the included information for research and educational purposes. If you wish to use copyrighted material from this site for purposes of your own that go beyond 'fair use', you must obtain permission from the copyright owner. Online database holds more than 500 different variables, as national, subregional, regional and global statistics or as geospatial data sets (maps)! Free SRTM 90m data for entire world! Download SRTM data to 9m resolutions, it's totally FREE ! The USGS now offers all users the entire Landsat 1-5 and 7 archive data at no charge using data product recipe. Free ASTER GDEM Data ! Download ASTER GDEM Data tiles, it's totally FREE ! Now, the Latest Global Map of Irrigation Areas (Latest version 5.0) is available as a FREE download. Free SRTM 90m Data for the entire world !